In India, Stigma Of Mental Illness Hinders Treatment Acknowledging a mental illness and seeking treatment are taboos in India, particularly for women. Activists are seeking to raise awareness of the problem in schools and urging the government to spend more on mental health programs. 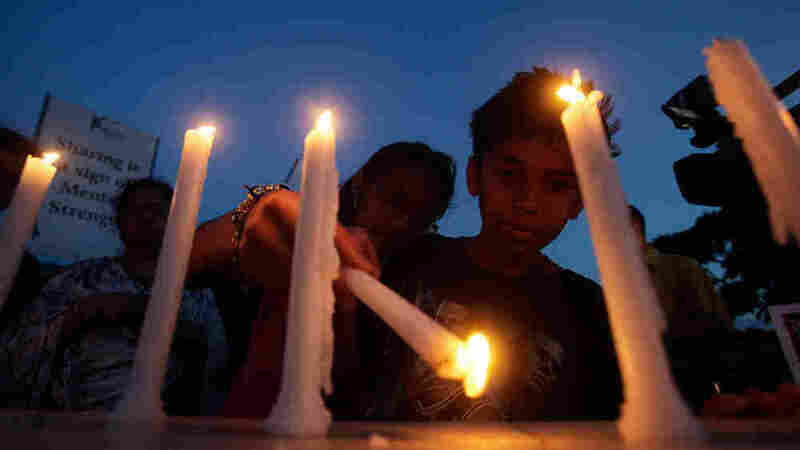 Children light candles to observe India's first National Mental Health Awareness Day, in New Delhi on Aug. 6. In India, people with severe mental illnesses often turn to temples and shrines, not to doctors. Some social workers are trying to change this by focusing their efforts on India's schools. At a small rural high school in Goa, along the Arabian Sea, child psychologist Prachi Kandayparker is leading a workshop to train teachers to deal with mental health issues among their students. The students here are poor, the children of miners and fishermen. They mostly speak the local language, Konkani. Kandayparker has a bright, engaging manner that draws out a dozen male teachers she is training. Soon, despite the sapping heat and humidity, there's a lively discussion in the room about how to deal with difficult teenagers. One of the teachers starts describing a problem he's having in class. A 17-year-old girl has been telling the other students that she is in love with him, he says. He worries about his reputation in this small town. The girl also says she has a brain tumor and epilepsy. The teacher doesn't know what to do. "What is happening is she's been referred to the counselor. We've decided we'll do a little bit of groundwork, get to know her friends and family, and if need be, we'll get a psychiatric evaluation," Kandayparker says. Taking her to a psychiatrist, of course, requires the consent of the girl's family. Kandayparker, who grew up near here, says the family probably will not agree to it because of the stigma of mental illness. Even though Kandayparker's organization, Sangath, offers therapy and medication for free, finances are not the biggest obstacle to treatment. "Most of the time you would have parents or teachers saying it doesn't happen here. It happens to somebody with a lot of problems, and we don't face that. When it comes to anything of mental illness, it would be a big no-no ... it would be hidden," Kandayparker says. The fact that the student is a girl further complicates the problem, Kandayparker says. Her parents will be even less willing to take action because it could scuttle her chances of marriage. Word always gets out in India, where the most private of matters are considered public domain, says Rukmini Pillai, a middle-class housewife in the capital, New Delhi. It took her more than a year to fully realize that she should seek treatment for her 16-year-old daughter. "She was not sleeping at all in the nights. If you gave her a cup of milk or something, she would just drop it. She got to the point where she would just sit on the bed. She couldn't recognize her face. Then she would start crying at times and laughing at times," Pillai says. Pillai is educated and married to an officer in the Indian Air Force. 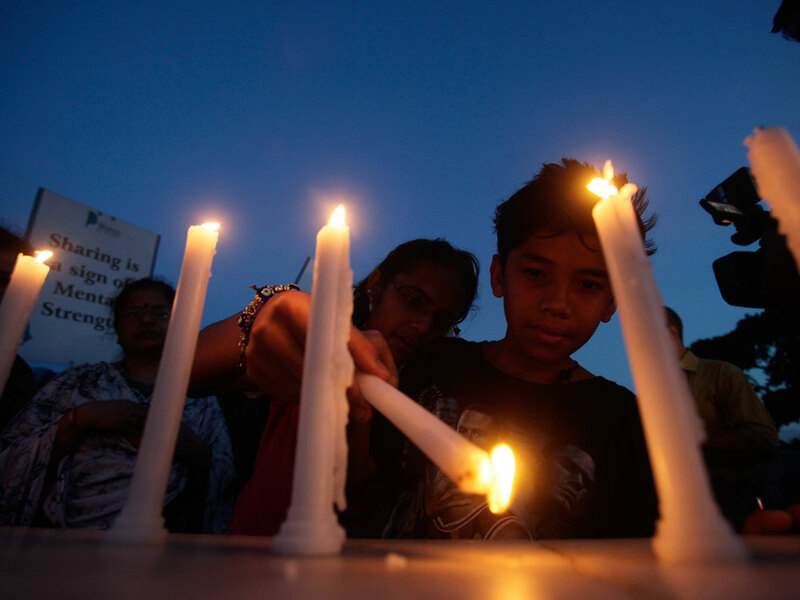 Yet when her daughter's school principal recommended that she take her to see a mental health professional, Pillai's first thought was of the dishonor it would bring. "I got so scared. Psychiatrist? What about the rest of her life? How will I get her married? I rang up my parents, but they said, 'It's your fault, you haven't got her married. This comes with sexual frustration, this kind of behavior.' So I stopped talking to my mother after that," Pillai says. That was 15 years ago, and the grandparents haven't seen their granddaughter since. She was diagnosed with schizophrenia and dropped out of school. Pillai hasn't had much help from other quarters, either, because there are few support groups or psychiatrists in India. "General physicians were not aware of mental illness. Initially they would say, 'Do some yoga and meditation.' They would say, 'You must not have given proper food diet to your child, that's why she became ill,' " Pillai says. Eventually Pillai began lobbying the Indian government to pay more attention to its mental health program, which she says is toothless and lacks sufficient money. India has largely succeeded in destigmatizing HIV and AIDS, she points out, but it hasn't done the same for mental illness. Pillai says she can only conclude that the government doesn't consider it a priority. Miranda Kennedy reported from India on a grant from the International Reporting Project.